Predictors of in Hospital Length of Stay After Laparoscopic Ventral Hernia Repair: A Multi Variate Logistic Regression Analysis. 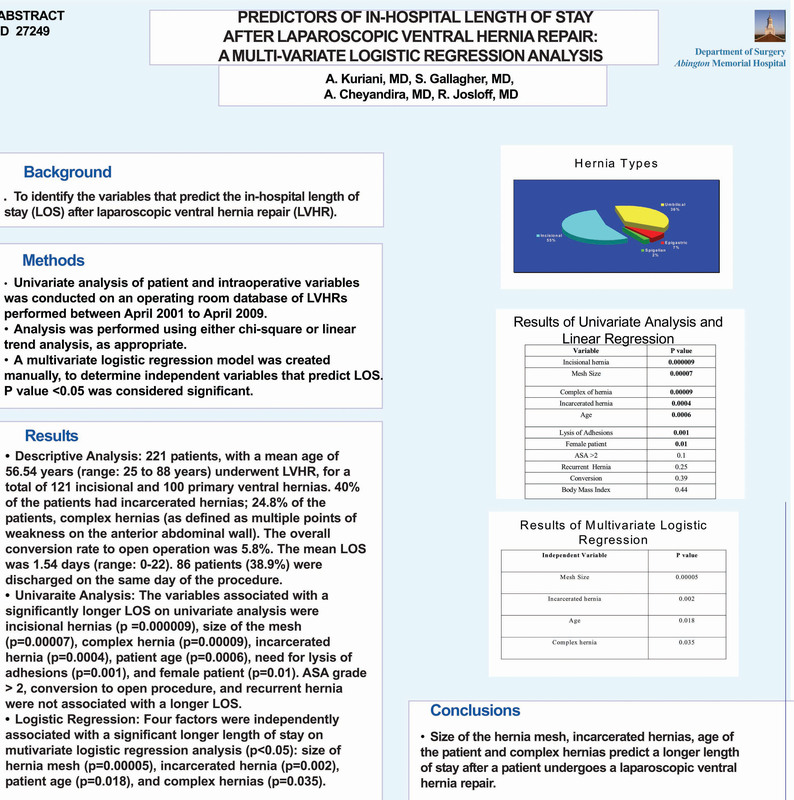 To elucidate the variables that significantly predict the in hospital length of stay (LOS) after a laparoscopic ventral hernia repair (LVHR). Univariate analysis of patient and intraoperative variables was conducted on an operating room database of laparoscopic ventral hernia repairsperformed between April 2001 to April 2009. Analysis was performed using either chi-square or linear trend analysis, as appropriate. A multivariate logistic regression model was created manually, to determine independent variables that predict LOS. A p value <0.05 was considered significant. Descriptive Analysis: 221 patients, with a mean age of 56.54 years underwent LVHR. There were a total of 121 incisional and 100 primary ventral hernias. 40% of the patients had incarcerated hernias. 24.8% of the patients were found to have complex hernias (as defined as multiple points of weakness on the anterior abdominal wall). The overall conversion rate was 5.8%. The mean LOS was 1.54 days (range: 0-22). 86 patients (38.9%) were discharged on the same day after the procedure. Univaraite Analysis: The variables associated with a significantly longer length of stay on univariate analysis were incisional hernias (p =0.000009), size of the mesh (p=0.00007), complex hernia (p=0.00009), incarcerated hernia (p=0.0004), age of patient (p=0.0006), need for lysis of adhesions (p=0.001) and female patient (p=0.01). ASA grade > 2, conversion to open procedure, and recurrent hernia were not associated with a longer LOS. Logistic Regression: Four factors were independently associated with a significant longer LOS on mutivariate logistic regression analysis (P<0.05). These were size of hernia mesh (P=0.00005), incarcerated hernia (p=0.002), age of patient (P=0.018), and complex hernias (P=0.035). Size of the hernia mesh, incarcerated hernias, age of the patient and complex hernias predict a longer length of stay after a patient undergoes a laparoscopic ventral hernia repair.